Grind the Coconut, Cumins seeds and Green Chilies into a fine paste. Mash the Yogurt (Curd) and mix with the paste well and keep it aside. Peel and cut the Chena (Jimikand) into medium size cubes. Boil it in a pressure cooker with Turmeric Powder, Red Chilly Powder and Salt in 1 cup water. Once it is cooked well add the paste and keep it in low flame. Stir well and cook it for 2-3 minutes. Keep a pan on medium flame and heat the Oil. 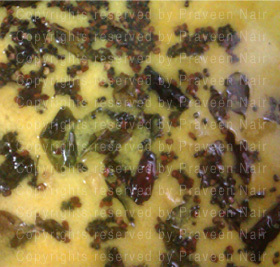 Once the mustard seeds start spluttering, add Red Chilies, Fenugreek Seeds and Curry Leaves. Keep it less about 1 minute and pour this into the Curry. Serve it with Rice for lunch or dinner.